Boiler Losing Pressure? Here's Why. If your boiler is losing pressure, there’s a good chance you’ve been told to adjust this pressure using the filling loop to “top up the boiler”. My advice would be. Don’t. Hopefully, the installer dosed your system with inhibitor as well as fitting a scale reducer (in hard water areas) and a magnetic system filter. Inhibitor breaks down any bad particles in the system, allowing the scale reducer to catch them. Every time you top up the boiler using the filling loop, you are diluting the inhibitor that’s in the system. Here are some of the reasons that result in a boiler losing pressure. And of course, if you need a boiler repair specialist, get in touch. 99% of the time, a boiler loses pressure due to boiler leaks in the boiler itself, or somewhere in the heating system. Before spending 100s of pounds on a repair engineer, there is a DIY fix that will sort out your boiler’s pressure. And, it comes in the form of the Fernox F4 leak sealant. This sealant travels around your heating system (including the boiler) and works its way into small gaps (i.e. the area that’s leaking). Fernox is a well known brand in the boiler protection/repair space, and the F4 leak sealant will get to work within 1-24 hours, hopefully fixing your boiler’s pressure loss in the process! Is Your Boiler Losing Pressure But No Leaks? 99% of the time, a boiler losing pressure is a leak. It’s as simple as that. Unless the dial sits at 0 even when topped up (which could be a sign of a faulty pressure gauge), there’s a leak somewhere – even if you can’t see it. Whether you have an oil, system or combi boiler, pressure loss is usually directly related to a leak. We’ve already created a guide on why boilers leak and how to find leaks here. 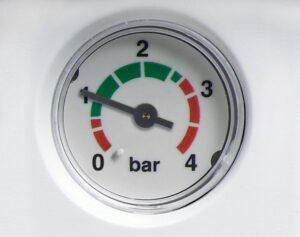 Most boiler operate at 1.0bar-1.5bar. But they can approach 3bar if there is a problem. A pressure release valve notices this abnormal change in system pressure and releases it. If the PRV has failed, it will cause the boiler to lose pressure. Central heating systems can collect air pockets over time (and they certainly do when they are refilled). Bleeding the radiators is the best solution, but the auto air vent (which is normally inside the boiler casing on newer combis) can also help to combat this problem. However, if the auto air vent is faulty, it could be losing pressure. This is the most common cause when looking at boiler pressure loss. The smallest of leaks can cause your system to lose pressure. Do a visual check of all radiators, radiator valves and towel rails. If there is any sign of water escaping, then this is the likely culprit. A small weep on a radiator valve is enough to cause pressure loss on your boiler. If the connections are extremely loose, tightening them up (carefully) will usually solve the issue. If it doesn’t, the culprit will need to be repaired or replaced. For the time it takes to drain down a system, replacement is usually the better option. If you’ve had work done to your central heating system, it may have collected some air in the radiators and towel rails. You can release this pressure by using a bleed key. To bleed radiators and towel rails, simply open the vent with the key slightly. You’ll start to here air hissing out. Once the air stops water will start to drop out (or spray out if you’ve open the vent too much). Close the vent off. Do this to every single radiator and towel rail in the property. It’s worth taking a small container to collect any water and a towel to protect carpets. Remember if you are constantly removing air, the pressure will drop each time you bleed the radiators. Every now and then expansion vessels will need to be repressurised. If they are not, they can affect the pressure of the boiler. In some cases, the boiler losing pressure could be for this very reason. A more likely cause though is the Schraeder valve is leaking. This is the valve on the vessel that will look the same as your car inner tube valve. A faulty valve can cause pressure loss in a boiler. Another possibility is that the diaphragm on the vessel has degraded over time and the pressure is being lost there. If repressurising the expansion vessel doesn’t work, or the suspect is a diaphragm or Schraeder valve, the vessel will need to be replaced to stop the boiler losing pressure. As we’ve already mentioned, leaks are the most common cause a boiler losing pressure. If your system is particularly old, there’s a good chance soldered joints have become weak. You only need a tiny leak for a system to start losing pressure. If you can find the leak, call a Gas Safe engineer to come and re-solder the joint to stop the leak. Use the filling loop to get the boiler pressure back to where it should be and see if there is any pressure loss. This is unlikely, but it’s happened before. There’s a chance the pressure gauge on the front of the boiler is not reading correctly. This is quite dangerous, especially if you are constantly topping up the pressure. It’s likely that this is the case if you top up the pressure and nothing happens (or the pressure changes very little). If the pressure doesn’t change and it’s not the pressure gauge, that’s a sign of a leak that you’d almost certainly notice! When you switch on your heating pipes, fittings and radiators expand, and pressure increases. So, a heating system might not leak when it’s off, but, a boiler could lose pressure when it’s on. The speed at which your boiler loses pressure determines how bad the leak is. So, if your boiler is losing pressure slowly (i.e. you can’t visibly see the dial going down, but pressure goes down overnight), the leak is small. If you can visibly see the pressure gauge going down, your boiler is losing pressure quickly, and the leak is big. Get it fixed as soon as possible, as it could be causing water damage. Struggling to understand why your boiler is losing pressure? Leave a note in the comments and we’ll get back to you.